There’s something not quite right when you shift gears, or push in the clutch pedal. You know there’s a problem with the drivetrain, you’re just not sure what. Here’s how to tell if your dual mass flywheel is faulty. Diagnosing a failing dual mass flywheel can be a little tricky since most of the symptoms could also mean issues with the clutch itself. A definitive assessment will involve visual inspection of all components, but if you have any of these issues, then your flywheel could be the culprit. Noise. If you hear a lot of rattle or banging sounds from the bellhousing, most likely the DMF has failed. These noises can be very loud and it should be replaced as a soon as possible. Slipping. When a clutch is slipping due to wear or otherwise not being up to capacity to the demand placed on it, you get a burning smell like that of burnt bread and gear oil mixed together. This usually happens first in the higher gears due to the higher gear ratios and increased wind resistance. If you do NOT smell the facings burning up when this is happening, it is your dual mass flywheel that is slipping and it needs to be replaced. Vibrations. These vibrations can usually be felt on the floor of the car and are due to the failure of the springs and other internal components. This leads directly to the flywheel’s inability to dampen the tremors with use and it must be replaced. Again, if you have any of these problems, it's time to visually inspect the clutch and flywheel. Check the friction surface for excessive heat checks and scoring. Discard if excessive. Check for excessive grease loss due to overheating. The internal springs are packed in grease. Check for visible damage including the ring gear, and other parts found inside the bellhousing. Check the rotational free play. Move the secondary plate (the one the pressure plate bolts up to) all the way to the left and mark the gear tooth. Move the plate all the way to the right and mark that gear tooth. There are specifications for each individual dual mass flywheel, but if the left to right "play" is more than an inch, it’s almost always time to replace it. Check for secondary plate rock. Grab the secondary plate on each side (180 degrees apart) and push one side in and see if the other side comes up. If you are able to rock it, it is no longer serviceable and must be discarded. An OE-spec replacement dual mass flywheel will restore the vehicle's stock performance and feel. The downside, of course, is the cost, as replacement DMFs are generally much more expensive that single mass flywheel conversion kits (if a conversion kit is available, of course). 2. Convert from a Dual Mass Flywheel to a Single Mass Flywheel. If you have increased the horsepower of your engine or tow heavy or you are interested in long term flywheel durability and minimal repair costs, it is a good idea to convert your dual mass flywheel to a single mass flywheel. *NOTE: Replacing one OE-spec dual mass flywheel with another is only a viable option if the vehicle's power output levels have remained stock (meaning you haven't modified the engine to produce more power). If you have modified your vehicle's engine to produce more power - or if you are using your vehicle for heavy hauling or towing - you should convert your dual mass flywheel to a single mass. Single mass setups, while generally a little louder (due to gear rollover noise), are more durable and more affordable if they require replacement again in the future. Like a lot of the parts on the modern automobile, dual mass flywheels are a compromise. On the plus side, dual mass flywheels reduce the torsional vibrations in the driveline and the other related vibration and noises. On the negative side, dual mass flywheels are expensive and more prone to failure than simpler, single mass systems (especially if a vehicle is modified to have increased torque). Single mass conversion kits replace a dual mass flywheel with a simpler, more robust system. While a single mass system will be a bit noisier* than a dual mass system, it will also be more reliable, especially in high torque/low idle rpm applications. *Gear Rollover Noise (aka Gear Rattle): The sound that a manual transmission makes when the gears in the gear box are in neutral and are shaken ever so slightly by the engine. It sounds like a light knocking or growling sound, and has absolutely no negative effect on the transmission’s performance or durability. The Gear rollover noise only occurs when the vehicle is idling and the transmission is in neutral. At Phoenix Friction Products, we offer a variety of single mass flywheel conversion kits. Some of the kits are offered by the Tier 1 OE clutch manufacturers, and some we engineer and then extensively test. In fact, we test all of the single mass conversion kits in-house, ensuring that these kits are more reliable than the dual mass units they replace. We also work hard to ensure these single mass kits don't negatively impact drivability...our testing procedure and metrics for success are reliability, smooth shifting, no increased pedal effort, and as little noise as possible compared to the OEM dual mass units. Should You Convert A Dual Mass Flywheel To A Single Mass? The decision to replace a dual mass flywheel with a single mass flywheel is generally pretty simple: If you're willing to tolerate a bit more drivetrain vibration, you'll be able to dramatically improve the reliability of your vehicle. What's more, single mass conversion kits are less costly than dual mass flywheel replacements. 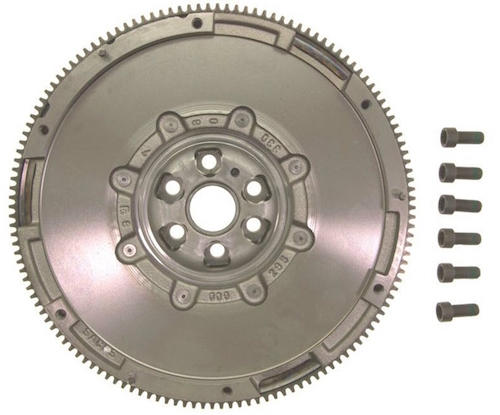 Once you've converted, your clutch will last longer, be less costly to service in the future, and will be far less likely to be discontinued than dual mass flywheel setups (some of which have reached obsolescence now and are increasingly difficult to replace).